Gli Stati Uniti dell' America delineati sulle ultime Osservazioni, Sesto Foglio che comprende parte della Carolina ed inoltre l'Isola di Terra Nuova colle altre isole del Golfo di S. Lorenzo. An unusually laid out example of Cassini's stunning 1797 map of North and South Carolina, Newfoundland, and part of the Bahamas. 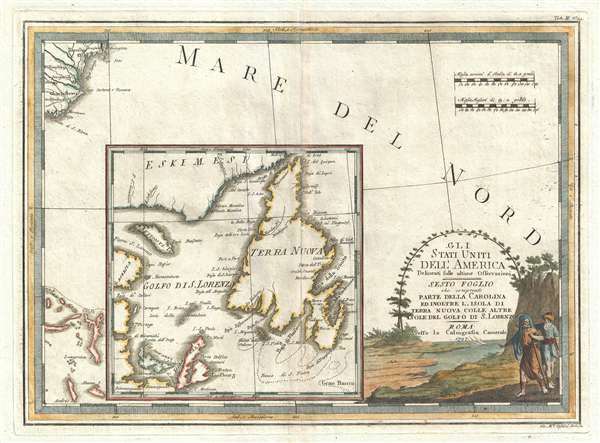 The map is dominated by a large inset of Newfoundland also covering parts of Labrador and Cape Breton Island. Beyond the inset, the map itself is set in the Atlantic Ocean near Cape Fear and Charleston, South Carolina, which is evident in the upper left corner. In the bottom left, part of the Bahamas are visible. The coverage of this map is, as we have already stated, unusual, but is derived from Cassini's sourcing of his North American Series from the Zatta-Mitchell map of 1755. Cartographically Cassini derived this map from the 1778 Zatta 12 sheet revision and expansions of the John Mitchell's seminal 1755 map of the eastern part of North America. Cassini published six maps of United States regions based upon Zatta's work, of which this is map no. 6. This work was published in Cassini's 1797 Nuovo Atlante Geografico Universale. Today all maps from this series are highly sought after for their exceptional beauty and fine engraving. Very Good. Minor centerfold wear and toning. Wide margins. Blank on verso. Platemark visible. OCLC 456402522. McCorkle, B. B, New England in Early Printed Maps 1513 - 1800, 797.3.